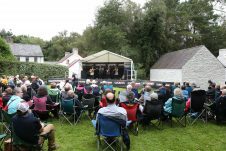 Press Eye - Bluegrass Music Festival - Ulster American Folk Park - 1st September 2018 Photograph by Declan Roughan Thousands flock to the Ulster American Folk ParkÕs Bluegrass Music Festival. The annual Bluegrass Music Festival at the Ulster American Folk Park, now in its 27th year, attracted thousands of visitors over the weekend. With a truly international feel, this yearÕs line-up included acts from the US, Canada, Belgium, England and from all over Ireland, North and South. Darin & Brooke Aldridge played a show stopping performance on Saturday night, followed by a breath-taking Spirit of Bluegrass gospel concert on Sunday evening, which closed the festival for another year. Unforgettable performances also included the Oregon duo Fellow Pynins, bluegrass troupers Mike Compton and Joe Newberry also from USA, as well as the homegrown talents of DerryÕs Eilidh Patterson, The Henry Family Band from Co. Down, and many more. Visitor Services Manager for the Ulster American Folk Park, Richard Hurst, commentedÐ ÒIt has been a very eventful weekend for Tyrone in the music and sporting world, and the excitement in the air has been palpable. The acts this year have been incredible, ranging from classic bluegrass sets to emerging artists coming onto the bluegrass and folk scene. ÒWe were delighted to welcome thousands of visitors from across Ireland, the UK and as far afield as Canada to the museum. We were delighted to have an outstanding line-up of international performers and all our visitors enjoyed the very best of bluegrass throughout the weekend.Ó This yearÕs Bluegrass Music Festival was supported by funding from Tourism NI and Fermanagh and Omagh District Council. Press Eye – Bluegrass Music Festival – Ulster American Folk Park – 1st September 2018 Photograph by Declan Roughan Thousands flock to the Ulster American Folk Park’s Bluegrass Music Festival. 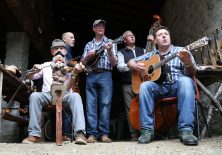 The annual Bluegrass Music Festival at the Ulster American Folk Park, now in its 27th year, attracted thousands of visitors over the weekend. 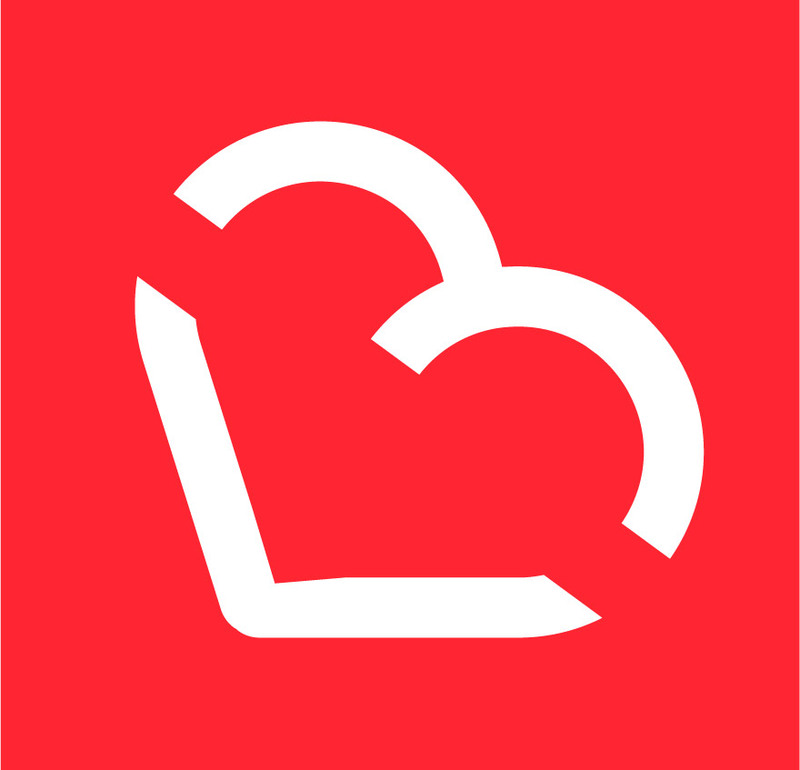 With a truly international feel, this year’s line-up included acts from the US, Canada, Belgium, England and from all over Ireland, North and South. Darin & Brooke Aldridge played a show stopping performance on Saturday night, followed by a breath-taking Spirit of Bluegrass gospel concert on Sunday evening, which closed the festival for another year. Unforgettable performances also included the Oregon duo Fellow Pynins, bluegrass troupers Mike Compton and Joe Newberry also from USA, as well as the homegrown talents of Derry’s Eilidh Patterson, The Henry Family Band from Co. Down, and many more. Visitor Services Manager for the Ulster American Folk Park, Richard Hurst, commented– “It has been a very eventful weekend for Tyrone in the music and sporting world, and the excitement in the air has been palpable. The acts this year have been incredible, ranging from classic bluegrass sets to emerging artists coming onto the bluegrass and folk scene. “We were delighted to welcome thousands of visitors from across Ireland, the UK and as far afield as Canada to the museum. We were delighted to have an outstanding line-up of international performers and all our visitors enjoyed the very best of bluegrass throughout the weekend.” This year’s Bluegrass Music Festival was supported by funding from Tourism NI and Fermanagh and Omagh District Council. Press Eye – Bluegrass Music Festival – Ulster American Folk Park – 1st September 2018 Photograph by Declan Roughan Geordie Mc Adam performing at Wheelwrights Yard. Thousands flock to the Ulster American Folk ParkÕs Bluegrass Music Festival. The annual Bluegrass Music Festival at the Ulster American Folk Park, now in its 27th year, attracted thousands of visitors over the weekend. With a truly international feel, this yearÕs line-up included acts from the US, Canada, Belgium, England and from all over Ireland, North and South. Darin & Brooke Aldridge played a show stopping performance on Saturday night, followed by a breath-taking Spirit of Bluegrass gospel concert on Sunday evening, which closed the festival for another year. Unforgettable performances also included the Oregon duo Fellow Pynins, bluegrass troupers Mike Compton and Joe Newberry also from USA, as well as the homegrown talents of DerryÕs Eilidh Patterson, The Henry Family Band from Co. Down, and many more. Visitor Services Manager for the Ulster American Folk Park, Richard Hurst, commentedÐ ÒIt has been a very eventful weekend for Tyrone in the music and sporting world, and the excitement in the air has been palpable. The acts this year have been incredible, ranging from classic bluegrass sets to emerging artists coming onto the bluegrass and folk scene. ÒWe were delighted to welcome thousands of visitors from across Ireland, the UK and as far afield as Canada to the museum. We were delighted to have an outstanding line-up of international performers and all our visitors enjoyed the very best of bluegrass throughout the weekend.Ó This yearÕs Bluegrass Music Festival was supported by funding from Tourism NI and Fermanagh and Omagh District Council. Press Eye – Bluegrass Music Festival – Ulster American Folk Park – 1st September 2018 Photograph by Declan Roughan Alan Steel from Limavady Thousands flock to the Ulster American Folk ParkÕs Bluegrass Music Festival. The annual Bluegrass Music Festival at the Ulster American Folk Park, now in its 27th year, attracted thousands of visitors over the weekend. With a truly international feel, this yearÕs line-up included acts from the US, Canada, Belgium, England and from all over Ireland, North and South. Darin & Brooke Aldridge played a show stopping performance on Saturday night, followed by a breath-taking Spirit of Bluegrass gospel concert on Sunday evening, which closed the festival for another year. Unforgettable performances also included the Oregon duo Fellow Pynins, bluegrass troupers Mike Compton and Joe Newberry also from USA, as well as the homegrown talents of DerryÕs Eilidh Patterson, The Henry Family Band from Co. Down, and many more. Visitor Services Manager for the Ulster American Folk Park, Richard Hurst, commentedÐ ÒIt has been a very eventful weekend for Tyrone in the music and sporting world, and the excitement in the air has been palpable. The acts this year have been incredible, ranging from classic bluegrass sets to emerging artists coming onto the bluegrass and folk scene. ÒWe were delighted to welcome thousands of visitors from across Ireland, the UK and as far afield as Canada to the museum. We were delighted to have an outstanding line-up of international performers and all our visitors enjoyed the very best of bluegrass throughout the weekend.Ó This yearÕs Bluegrass Music Festival was supported by funding from Tourism NI and Fermanagh and Omagh District Council. Press Eye – Bluegrass Music Festival – Ulster American Folk Park – 1st September 2018 Photograph by Declan Roughan Midnight Skyracer on stage at School Field. Thousands flock to the Ulster American Folk ParkÕs Bluegrass Music Festival. The annual Bluegrass Music Festival at the Ulster American Folk Park, now in its 27th year, attracted thousands of visitors over the weekend. With a truly international feel, this yearÕs line-up included acts from the US, Canada, Belgium, England and from all over Ireland, North and South. Darin & Brooke Aldridge played a show stopping performance on Saturday night, followed by a breath-taking Spirit of Bluegrass gospel concert on Sunday evening, which closed the festival for another year. Unforgettable performances also included the Oregon duo Fellow Pynins, bluegrass troupers Mike Compton and Joe Newberry also from USA, as well as the homegrown talents of DerryÕs Eilidh Patterson, The Henry Family Band from Co. Down, and many more. Visitor Services Manager for the Ulster American Folk Park, Richard Hurst, commentedÐ ÒIt has been a very eventful weekend for Tyrone in the music and sporting world, and the excitement in the air has been palpable. The acts this year have been incredible, ranging from classic bluegrass sets to emerging artists coming onto the bluegrass and folk scene. ÒWe were delighted to welcome thousands of visitors from across Ireland, the UK and as far afield as Canada to the museum. We were delighted to have an outstanding line-up of international performers and all our visitors enjoyed the very best of bluegrass throughout the weekend.Ó This yearÕs Bluegrass Music Festival was supported by funding from Tourism NI and Fermanagh and Omagh District Council. 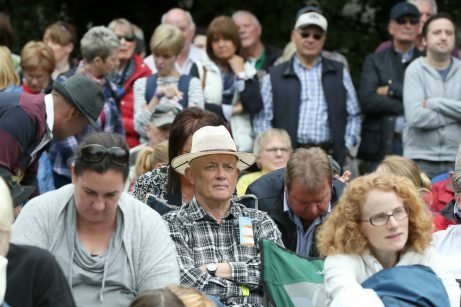 Press Eye – Bluegrass Music Festival – Ulster American Folk Park – 1st September 2018 Photograph by Declan Roughan Thousands flock to the Ulster American Folk ParkÕs Bluegrass Music Festival. 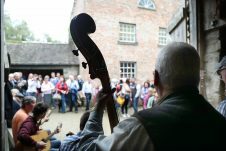 The annual Bluegrass Music Festival at the Ulster American Folk Park, now in its 27th year, attracted thousands of visitors over the weekend. With a truly international feel, this yearÕs line-up included acts from the US, Canada, Belgium, England and from all over Ireland, North and South. Darin & Brooke Aldridge played a show stopping performance on Saturday night, followed by a breath-taking Spirit of Bluegrass gospel concert on Sunday evening, which closed the festival for another year. Unforgettable performances also included the Oregon duo Fellow Pynins, bluegrass troupers Mike Compton and Joe Newberry also from USA, as well as the homegrown talents of DerryÕs Eilidh Patterson, The Henry Family Band from Co. Down, and many more. Visitor Services Manager for the Ulster American Folk Park, Richard Hurst, commentedÐ ÒIt has been a very eventful weekend for Tyrone in the music and sporting world, and the excitement in the air has been palpable. The acts this year have been incredible, ranging from classic bluegrass sets to emerging artists coming onto the bluegrass and folk scene. ÒWe were delighted to welcome thousands of visitors from across Ireland, the UK and as far afield as Canada to the museum. We were delighted to have an outstanding line-up of international performers and all our visitors enjoyed the very best of bluegrass throughout the weekend.Ó This yearÕs Bluegrass Music Festival was supported by funding from Tourism NI and Fermanagh and Omagh District Council. Press Eye – Bluegrass Music Festival – Ulster American Folk Park – 1st September 2018 Photograph by Declan Roughan Crowds listen to Midnight Skyracer on stage at School Field. Thousands flock to the Ulster American Folk ParkÕs Bluegrass Music Festival. The annual Bluegrass Music Festival at the Ulster American Folk Park, now in its 27th year, attracted thousands of visitors over the weekend. With a truly international feel, this yearÕs line-up included acts from the US, Canada, Belgium, England and from all over Ireland, North and South. Darin & Brooke Aldridge played a show stopping performance on Saturday night, followed by a breath-taking Spirit of Bluegrass gospel concert on Sunday evening, which closed the festival for another year. Unforgettable performances also included the Oregon duo Fellow Pynins, bluegrass troupers Mike Compton and Joe Newberry also from USA, as well as the homegrown talents of DerryÕs Eilidh Patterson, The Henry Family Band from Co. Down, and many more. Visitor Services Manager for the Ulster American Folk Park, Richard Hurst, commentedÐ ÒIt has been a very eventful weekend for Tyrone in the music and sporting world, and the excitement in the air has been palpable. The acts this year have been incredible, ranging from classic bluegrass sets to emerging artists coming onto the bluegrass and folk scene. ÒWe were delighted to welcome thousands of visitors from across Ireland, the UK and as far afield as Canada to the museum. We were delighted to have an outstanding line-up of international performers and all our visitors enjoyed the very best of bluegrass throughout the weekend.Ó This yearÕs Bluegrass Music Festival was supported by funding from Tourism NI and Fermanagh and Omagh District Council. The Ulster American Folk Park Bluegrass Festival is a memory-making three days of toe-tapping rhythms of mandolins, fiddles and guitars. Taking place each year on the last weekend of August, the Festival featured award-winning American, Canadian and European bands to Omagh as well as acclaimed acts from across Ireland. This year’s line-up includes traditional music veterans Mike Compton and Joe Newberry, Demolition String Band, Whiskey Deaf, Fellow Pynins and Allen Family Reunion all direct from the USA and Canada, plus Old Salt Collective from Belgium and Midnight Skyracer and Old Baby Mackerel from England. Darin & Brooke Aldridge played a showstopping performance on Saturday night, followed by a breath-taking Spirit of Bluegrass gospel concert on Sunday evening, which closed the festival for another year. 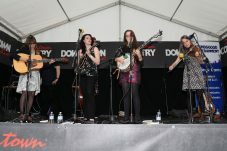 Unforgettable performances also included the Oregon duo Fellow Pynins, bluegrass troupers Mike Compton and Joe Newberry also from USA, as well as the homegrown talents of Derry’s Eilidh Patterson, The Henry Family Band from Co. Down, and many more. Visitor Services Manager for the Ulster American Folk Park, Richard Hurst, commented– “It has been a very eventful weekend for Tyrone in the music and sporting world, and the excitement in the air has been palpable. The acts this year have been incredible, ranging from classic bluegrass sets to emerging artists coming onto the bluegrass and folk scene. This year’s Bluegrass Music Festival was supported by funding from Tourism NI and Fermanagh and Omagh District Council. An excellent day out for all the family. We walked round the park before the music started and got a real insight into the early life of Irish emigrants to America. There are characters in period costume to explain what daily life would have been like – from the local merchant or post-mistress to the school-mistress. Definitely worth a visit and could easily spend the whole day. There’s a reasonably priced cafe serving meals and snacks on site. The old street from Edwardian Ireland was probably my favourite as you really felt you had travelled through time. I stayed in the Brae Heather Lovely family run B&B located 5 miles from Omagh town.